In our country, macaroniis also known as rigatoni. It’s a shorter elongate pasta, which is hollow and curved. Rigatoni is most commonly used to various kinds of sauces because their hollow shape perfectly catches the sauce and thus transmit even more flavor to you. However, imagination has no limits, and thus you will also find them useful while preparing pasta salads or as a supplement to meat. 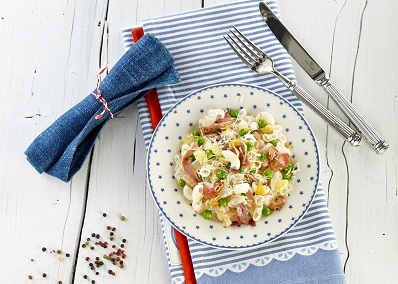 Enjoy our RISOLINO macaroni and you no longer want others! Try and taste the rice penne RISOLINO and prepare a delicious meal that everyone will praise. Just rice flour, tapioca, starch, tumeric and a little amount of salt. 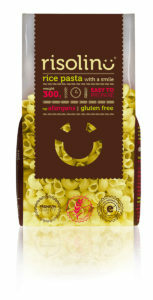 Gluten free pasta, no artifical colourants, no allergens. Put on to boil (1 liter of water per 100g of rice pasta), add a little salt and a drop of vegetable oil. Put pasta into boiling water and cook it on high heat 10-14 minutes. Stir frequently. Best way is to taste. Before you decant pasta, we recommend leaving it in a pot for 3 minutes in hot water. Then, decant, rinse well under running water (preferably cold) and drain.